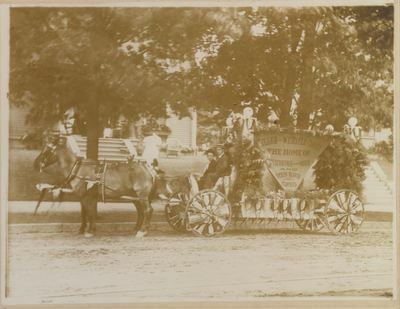 "Miller & Webster Clothing Co. Bangor Carnival Parade Float, June 18, 1"
"The Miller & Webster Clothing Co. had a float which supported four big columns of evergreen and covered at all available points with pennants of Carnival week in colors, with Atwood's flying machine painted on the broad end." The banner indicated Miller & Webster were "The Home of Hart Schaffner and Marx and Stein Bloch Clothes." Miller and Webster was located at 14-18 Broad Street in Bangor. Edwin N. Miller served as company tresurer. The Webster is not identified in the 1912 Bangor city directory.